We are delighted to announce that Pitreavie Athletics Centre has honoured John Mcdonald, a much-respected and accomplished local athletics coach, who passed away last year, with a commemorative naming of the grandstand at the facility. Fife’s Armed Forces & Veterans Community Champion, Councillor Rod Cavanagh has strengthened support for the armed forces community this week after an agreement was made with Fife Sports and Leisure Trust to offer 30% discount to its leisure facilities. Staff at Carnegie Leisure centre have paid tribute to a much-respected colleague with the installation of furniture in his memory. Fife’s first indoor football training facility was officially opened today (Wednesday 30 May) by provost Jim Leishman. The Fife Council and sportscotland funded facility at Michael Woods Sports and Leisure Centre is managed by Fife Sports and Leisure Trust – the region’s leading sports and leisure service provider – who hosted the event. Our initiative to increase physical activity opportunities to high school pupils in Dunfermline has been expanded, engaging with even more young people. Youngsters and teachers from Lochgelly High School are gearing up for a challenge of a lifetime, taking their physical and mental strengths to new limits. 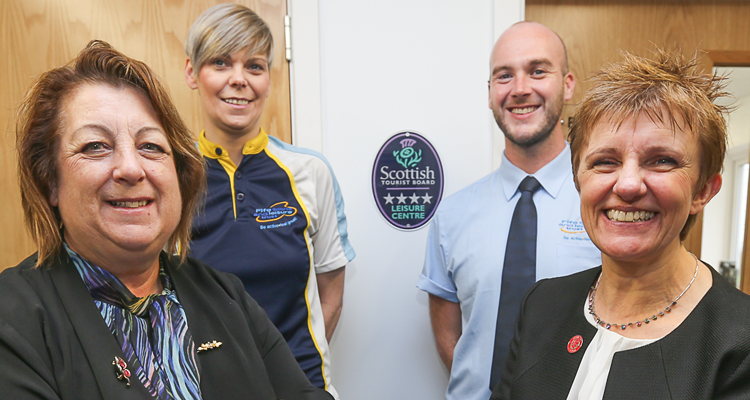 Our dedicated sports hub in Lumphinnans has received a four star grading following a recent Visit Scotland inspection which praised the facility’s excellent condition. Fife Sports and Leisure staff have paid tribute to a local man who gave up his time to help others participating in physical activity classes aimed to improve health and wellbeing. Helpful staff and high levels of cleanliness - just two of the highlights which have seen an upgrade in a recent Visit Scotland inspection report praising Kirkcaldy Leisure Centre. Construction work on a regional indoor football training facility at Michael Woods Sports and Leisure Centre is almost complete. The facility, which is funded by Fife Council and sportscotland, will be the first of its kind in Fife. We are marking over 20 million visits by active locals to our facilities across the region. Our chief executive has welcomed the latest attendance figures to leisure centres across Fife, thanking local people for continuing to support the organisation’s facilities.